There's no rest for the wicked, and that certainly applies to us Spitfire Sisters. Here's an insight into a typical week for us and what goes on behind the scenes! Monday is always Spitfire Admin day! It's become a fully incorporated part of our routine. A couple of years into our Sisterhood we realised that we essentially needed office hours to make sure we were keeping up to date with everything. We get together around 9:30, put the kettle on, write a list, and get stuff done. We go through our flagged emails, send out contracts, answer enquiries, plan gigs...our to do list is never ending, which is lovely; it's good to be busy! Anna and Hannah making themselves at home in Louisa's living room. Yes, that it a jacket potato on that vintage plate and a cup of tea in a vintage cup. Louisa leading a vocal workshop earlier this year as part of WJF with her good pal Henrietta the Hohner Organetta. No meeting (one of the only days of the week we don't see each other) but plenty to do. At the moment we’re spending time learning new vocal and saxophone parts that Louisa has written for us and the band as we have plenty of upcoming tour dates, including our show at the Theatre Royal Winchester! Tickets available here. Wednesday is Jazz day! We run Winchester Jazz Festival, which takes place every September, and yes - we’re already planning next year’s festival. We're currently booking bands, contacting venues, and looking for sponsors. If you're interested in being involved in the festival in any way, you can contact us here. You may have seen on our Instagram all the amazing photos that Anna took of the 2017 festival. If you haven't had a chance to have a look, check it out here! As part of WJF, on Thursday and Friday nights we book the Jazz at the Corner House, a wonderful venue in Winchester. We’ll always try and pop down to greet the act (and maybe have a drink or too!). You can see the listings for the rest of the year here. We gig throughout the week but mainly our performances fall on Fridays and Saturdays. 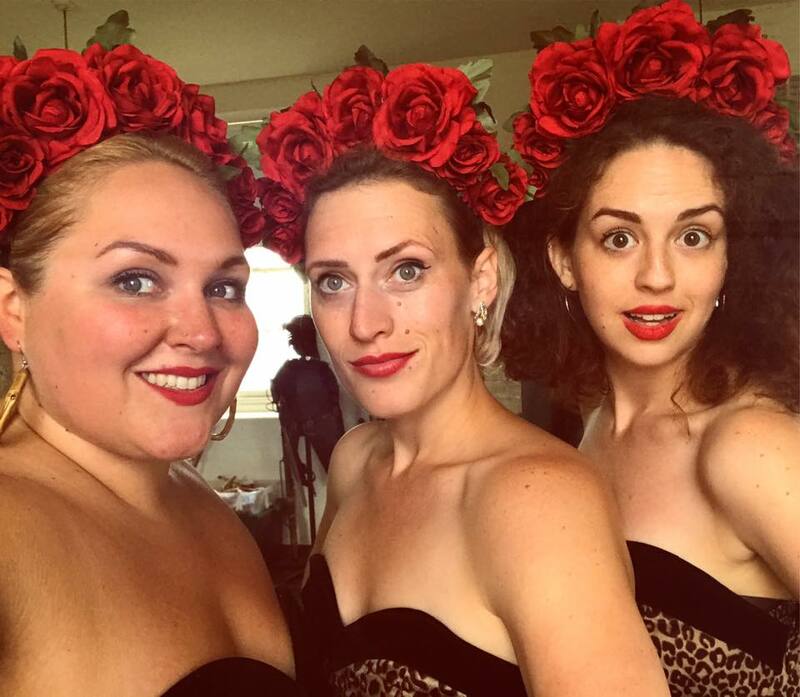 It never ever gets old to put on our Ruby Woo, curl our hair (Hannah doesn't really need to do this but she likes to feel included in the hair prep), and stick on an amazing outfit from Lindy Bop or Ghost. You can see all our upcoming performances here. 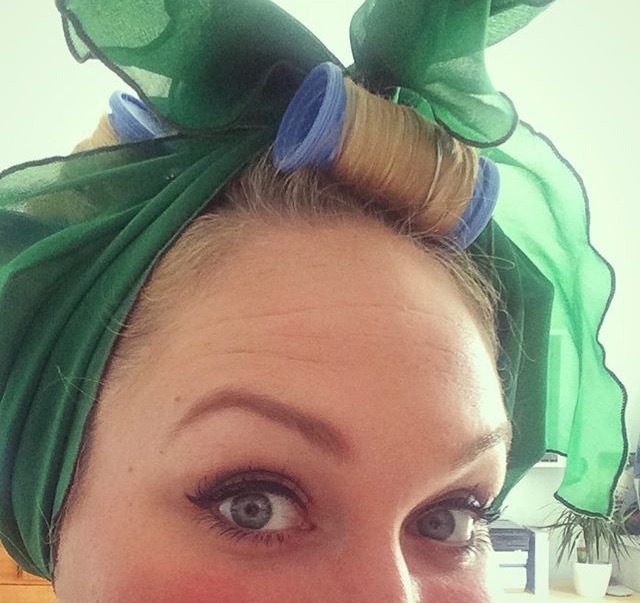 When leaving the house in curlers, it is customary to wrap them in a fabulous scarf. Sunday is band rehearsal day, and it's always a delight to get the gang back together. With eleven of us it's a loud affair. We rehearse until quite late (much to the joy of the neighbours!) because not only is there plenty of music to play, there is also always loads to catch up about. We hope you've enjoyed a brief insight to our week! Are there any behind the scenes moments you would particularly like to see? Let us know and we'll blog about them.